Can't even begin to explain to you how much my Grandad's dog seemed to be loving Born in the USA when I took that pic. 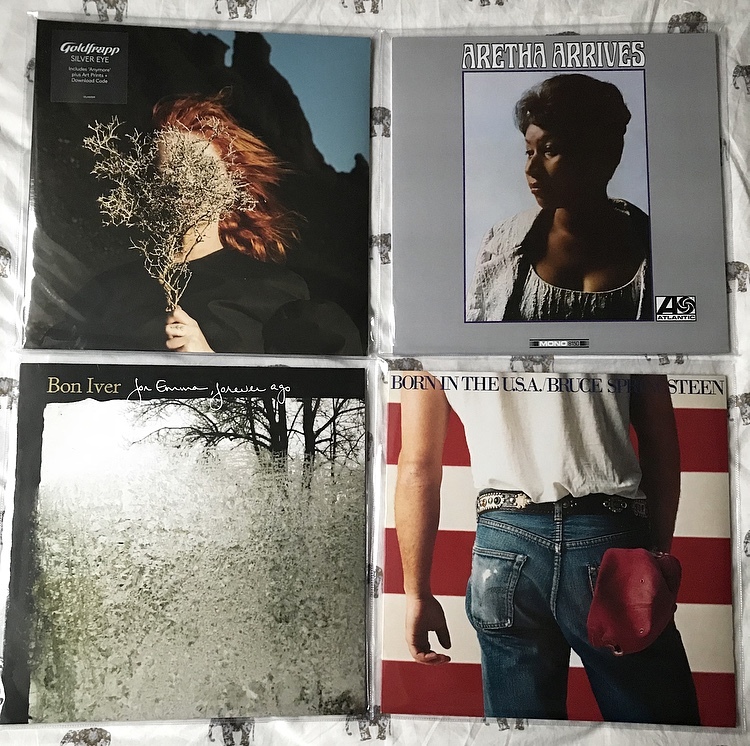 Today I was going to talk about my five current favourite records, but quickly realised that the image would look very uneven, so four it is. In the past year or so, I've gotten really into vinyl. It's obviously a fairly old music format, but nonetheless one that has made a major comeback in recent years. I bought a record player last Spring and have been enjoying the sounds it makes ever since. I don't have hundreds of records, as of yet, but I have a bunch from various genres and periods. I thought it might be nice to inject a little bit of music conversation back into the blog, so I wanted to talk about the records I'm listening to the most right now. Vinyl has the nicest, warmest sound to it - something rare when considering the other ways we listen to music these days. It has such a rich, in-the-room sound, that you could only compare to an intimate live performance. And that's why I love it. It's in the room and it fills the room, and when you go back to listening to music on your phone whilst you're out on the go, you notice the slightly more tinny, artificial sounds your earphones have to offer. That's why I prefer vinyl, it's raw and a little scratchy, but it has a warmth I can't describe, and it encourages you to listen to an album from start to finish, something we rarely do anymore. One of my absolute favourite albums from last year is Silver Eye by Goldfrapp. I love the electronic nature of the music, and yet it's not too deeply into the genre - I find a lot of electronic music can be very overdone, but this is the perfect balance: slightly understated but definitely comfortably within the genre. The breathy vocals really compliment the synthesiser, almost completely combining the sounds, which I love to hear. I also absolutely love the artwork on this album. It's so simple and understated, yet has something very bold about it, which is very fitting with the music. A few of my favourite tracks include Systemagic, Faux Suede Drifter, and Beast That Never Was. Next up is Aretha Franklin's twelfth studio album, Aretha Arrives. I love Aretha Franklin, I think her voice is just incredible. Soul is pretty much my favourite genre of music, and there's no soul like Aretha. I find her version of Satisfaction an amazing transformation from the original, putting her own twist on the song and making it seem like it's her own. You Are My Sunshine is one of my favourite tracks on the album, starting off by simply showing off her voice and then kicking into the song with the gusto that only Aretha seems capable of. I love listening to this one on vinyl in particular because it feels so authentic of the 60s when it was released - it makes me feel almost as though I was there. Bon Iver is one of my favourite bands, but one I think you have to be in the right mind frame to listen to. If I want to listen to an album I truly love and I'm in quite a quiet mood, I'll put For Emma, Forever Ago on. It's such a stunning album; it truly gives me chills whenever I hear it. I love the timbre of the music. I think the songs, lyrically, can sound quite cold and disconnected, but the timbre is so rich and warm, and you hear that more than ever on vinyl. The album features one of my all favourite songs, which is re:stacks; I just think it's the most beautiful song in the world. My other favourites on this album are Blindsided and Flume. This is one that I don't listen to enough, but am always ready to play when the time is right. The last one I'm going to mention today is Born in the USA by Bruce Springsteen. As you can see in the image above, my Grandad's dog, Vinnie, is also a big fan; never seen a dog so pleased to be listening to an album. I've actually only gotten into Springsteen in the last few years, but when I bought this album my Mum said she thought my Dad probably had one of the originals somewhere in our loft, so I'll have to have a hunt around for that at some point. A fun fact is that it was actually released two days after my parents got married. This is a classic album and will probably always be considered one; there wasn't tons of rock that survived the 80s, but this one helped the genre through. Some of my favourite tracks are Cover Me, I'm On Fire, Dancing In The Dark, and My Hometown. What are some of your favourite albums to listen to on vinyl?